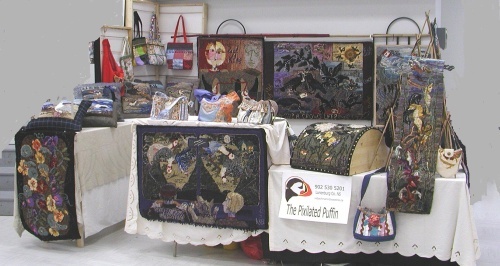 Pixilated Puffin Design is a fiber art studio, dealing exclusively in the original designs of Valentine Bachmann of Lunenburg County Nova Scotia, Canada. Hooked Pieces: Multi fiber (wool, silk, roving etc.) hookings. There is usually a small stock available of unique Mats, Sofa Pillows, Chair Pads and Wall Hangings. Quilts: Pieced, appliqued and embroidered these are indeed true works of art. The quilts are created in a mix 'n match of wool, silk and fine cottons and many unique natural-synthetic-fibre & metallic blends that are 'just-rite' for the look. A limited selection of quilts are normally available from stock. Due to retailers’ concerns about on-line competition by our website, we no longer sell at retail on this site. 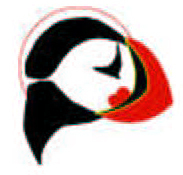 As it has been from the beginning, this site is used primarily to introduce new work, and to display images and information about our lines of bags and other fiber art. We intend to develop additional service aspects for both retail customers and wholesale customers—information about fabrics, design for function, information about care of bags, etc. We continue to sell at our own booths at Retail Craft Shows and Markets in Canada. We also welcome customer-guests at any time at our studio in Hebbville, Nova Scotia and will sell at retail to these visitors. From time to time, we sell off out-dated sample bags at a discounted retail price as well. On this site, we will place a listing of retail venues where our lines can be purchased. Valentine has developed custom designs for bags and other fiber art pieces, from time to time for retail customers, using the Internet and email for information exchange. She continues to perform this service when requested. As a design house, we intend to develop this aspect of our retail business on this site—as this service would not be reasonable to expect from a retail outlet which is carrying her lines.